HomeNEW FORM of Haiku & Poetry. NEW FORM of Haiku & Poetry. 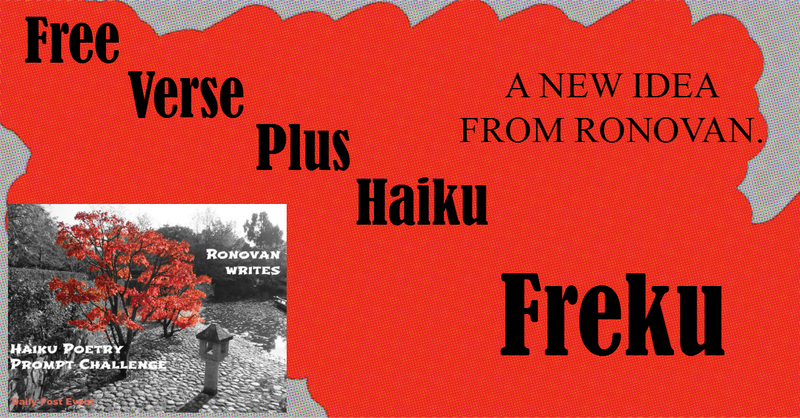 What do you get when you combine Free Verse Poetry with Haiku? A new form of poetry I call Freku. I’ve looked around and haven’t found this concept anywhere, but there is always that possibility of it being an old idea. Write a poem with stanzas four lines each. The first two stanzas should rhyme. The next two stanzas should rhyme. Continue in this manner for each stanza until completed with poem. Close with a Haiku of 5/7/5 or 3/5/3 syllable structure that is basically the prose piece in three lines. By taking a standard poem (And I do mean a normal poem, regardless of my example I did.) and then attempting to sum that poem up in the three lines of a Haiku, you have quite a challenge. It is almost like developing a proverb of the poem. Every two lines rhyme. That is how I did it. Call it my daily awareness of entries into the Fiction Challenge where I look for those pesky adverbs and dialogue tags, or my glutton for punishment, but I enjoyed cutting out the fat of the poem I created, maintaining rhymes, and maybe ending with a better poem. After I created the idea of the poem and haiku combination, I went looking for other possible similar creations. I found the Chōka, a form Japaense poetry, or Waka. Waka means Japanese poem. The Chōka is, or was, a narrative Waka in the 5-7-5-7-5-7-5-7-7 form during the Nara period. Think of this as an extended Tanka (5-7-5-7-7). The Chōka died out as a poetic form by the 10th Century (the beginning of the Heian period), and was replaced by the Tanka. My inaugural piece, Gasps for Breath, was created initially as a free form poem with no aim at anything but expression. Somewhere along the way I decided to sum it up in a Haiku using the challenge words from my weekly haiku challenge. That led me to the creation of the Freku. It took longer to develop the name than the actual poem piece. I chose several names but all were taken for either poetry forms or some very inappropriate things. I’m still not completely happy with the name but it does give some clue to what type of poetry it is. It has been pointed out to me that this is similar to a Haibun, which combines prose in the various forms with a closing/summary Haiku. For my purpose of this exercise I intend to stick to poetry without any forms of prose outside of poetry. The Freku is not a new challenge prompt idea. Some have linked to it with their own versions, and that is somewhat humbling to think people liked the idea that much. If you want to do a Freku and share it, you can always link it to the Weekly Haiku Challenge, and I’ll include the link in the review. It doesn’t have to relate to the challenge prompts. It would be the least I could do for anyone taking something I came up with and trying it out. Ronovan Hester is an author, with his debut historical adventure novel Amber Wake: Gabriel Falling due out in December of 2015. He shares his life as an amnesiac and Chronic Pain sufferer through his blog RonovanWrites.WordPress.com. His love of poetry, authors and community through his online world has led to a growing Weekly Haiku Challenge, Weekly Fiction Prompt Challenge, and the creation of a site dedicated to book reviews, interviews and author resources known as LitWorldInterviews.com. I need to give this some thought, might try over the winter break to see if this works for me!